That produces Bézier curves like the below edited screenshot of Inkscape. But how do I minimize the number of inflection points? The wiggliness of this arrangement of nodes is what caught my eye. Other than this arrangement of nodes this algorithm produces curves that look okay. 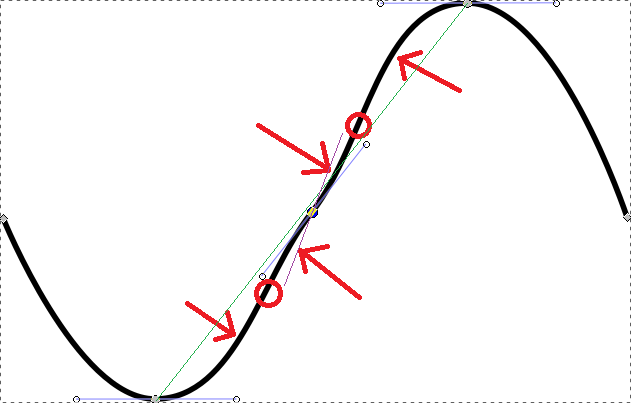 Intuitively I understand that mirroring the third node's control points across the Bézier curve will eliminate the inflection points I circled. An analogous solution that I think would work in general would be to minimize the control points' distance from the resulting Bézier curve while keeping them in a straight line. But I don't know how to formalize these intuitions. Browse other questions tagged bezier-curve or ask your own question. How can I draw a Bézier Curve through a set number of points?